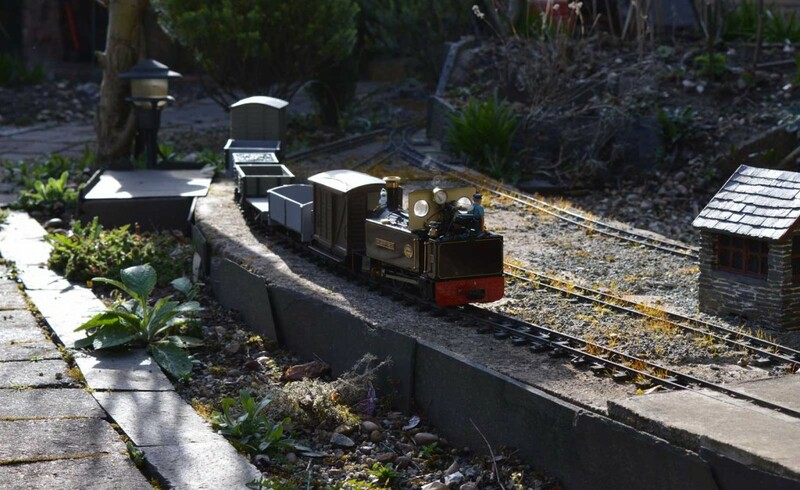 “Wilberforce” was the first – and so far the only – steam loco purchased new for the Elmdon Heath Light Railway, where it works alongside a Wrightscale “Wren”, and the rather fantastical vertical-boilered tram loco I described in December 2015. 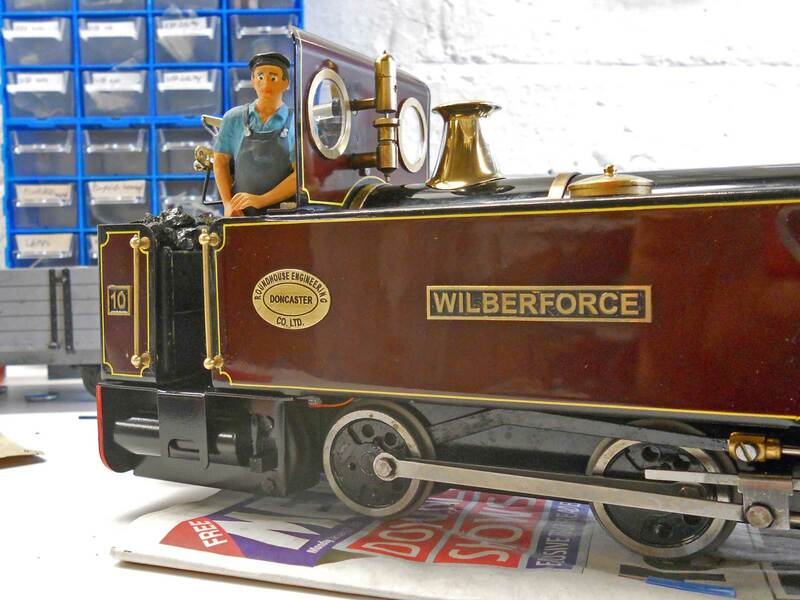 It’s an example of the well-known “Millie” class: popular, reliable, docile – and perhaps a little dull? This is the story of the various modifications carried out since the loco was delivered from Roundhouse Engineering’s Doncaster works in May 2010. Tag Gorton is largely to blame: a well-thumbed copy of “Tag Gorton’s Live Steam Workshop” has been the inspiration for many of the alterations. The book is now out of print, but well worth picking up should you be lucky enough to come across a copy. 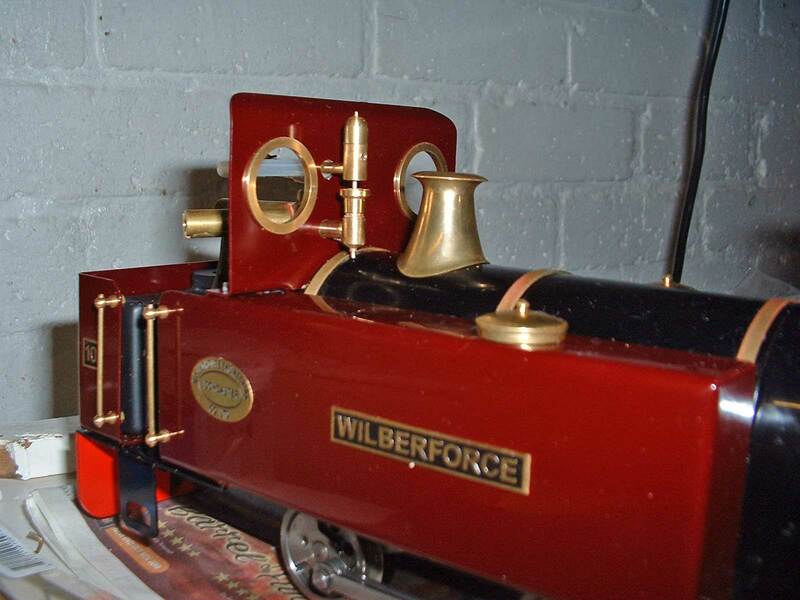 Of course, “Wilberforce” has ended up looking very different to “Jack Tar”, the Millie-class loco Tag describes in chapter 3 of his book. 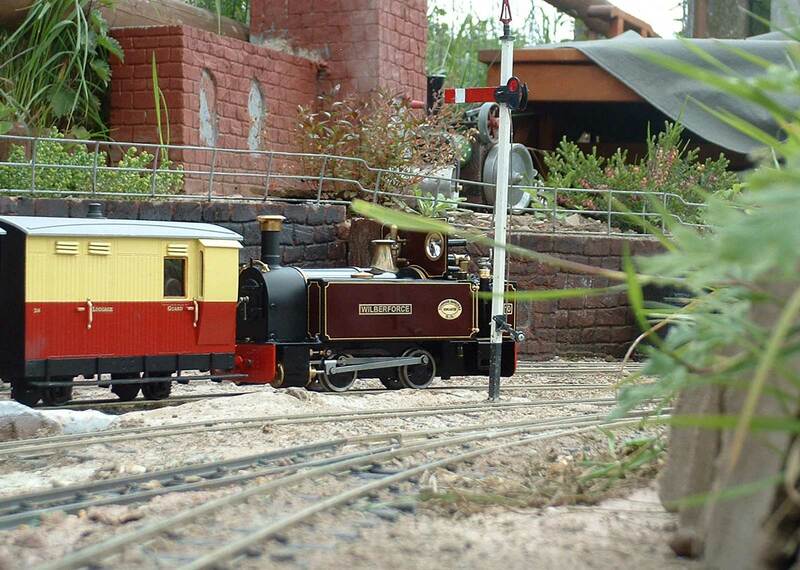 And that’s fine – one is a Longlands and Western loco, and one an Elmdon Heath loco; the two lines have different needs and their chief engineers have different aesthetic tastes. 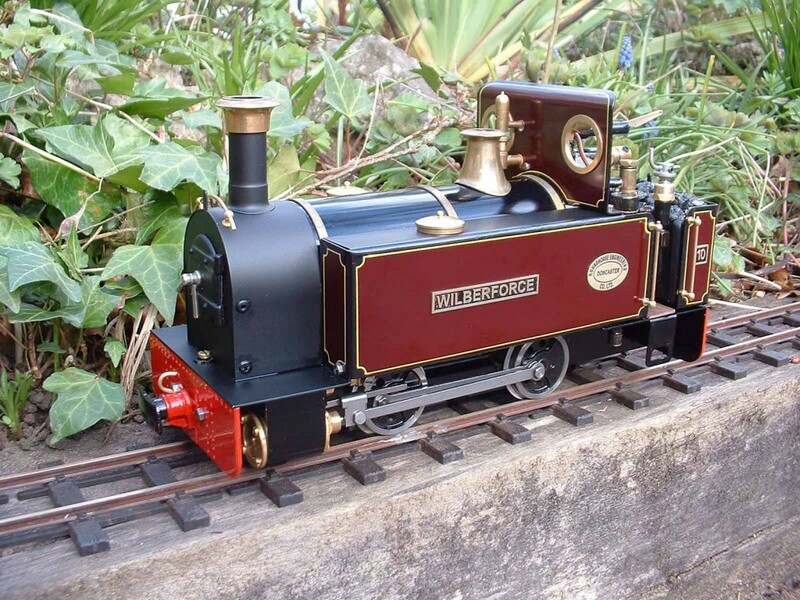 The point is: the book opened my eyes to the possibilities of modifying off-the-shelf locos, and what the “average enthusiast” can achieve with comparative ease – and for that I’m very grateful. As delivered from Roundhouse, in Victorian maroon. 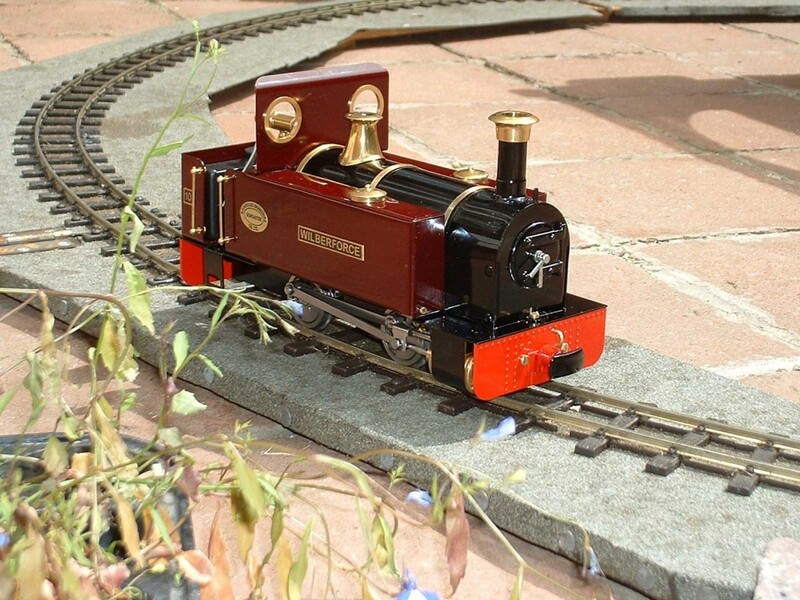 “Wilberforce” was delivered in unlined Victorian maroon, and was tried out with much enthusiasm on the small oval of track on our patio that we used whilst the main line was under construction. 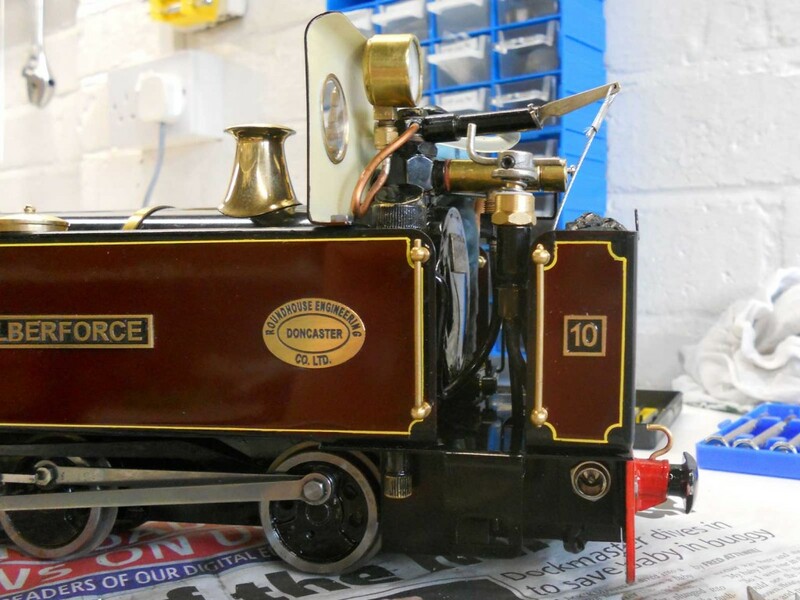 The modifications started small, using Roundhouse’s own range of enhancement parts: buffer beam overlays, the slide bar and crosshead set, safety valve bonnet, cylinder covers, and the really useful dummy brake handle which makes the gas so much easier to set. Before long these were followed by a pressure gauge, gauge glass and water top-up: the former is a useful addition, the latter two I have actually used very little as the loco, with its large pot boiler, runs for so long anyway on a single fill. 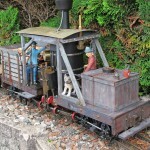 A Summerlands Chuffer transformed the sound of the loco in a most satisfactory way. Soon we found ourselves contemplating names, and “Wilberforce” was selected based on local connections. (William Wilberforce’s wife Barbara was born at Elmdon Hall, just up the road from here.) MDC plates supplied the nameplates. I’m sorely tempted to continue this local source of names, but it will need quite a loco to fit on “Abraham Spooner-Lillingston”. By this point, an additional boiler band had also been added. 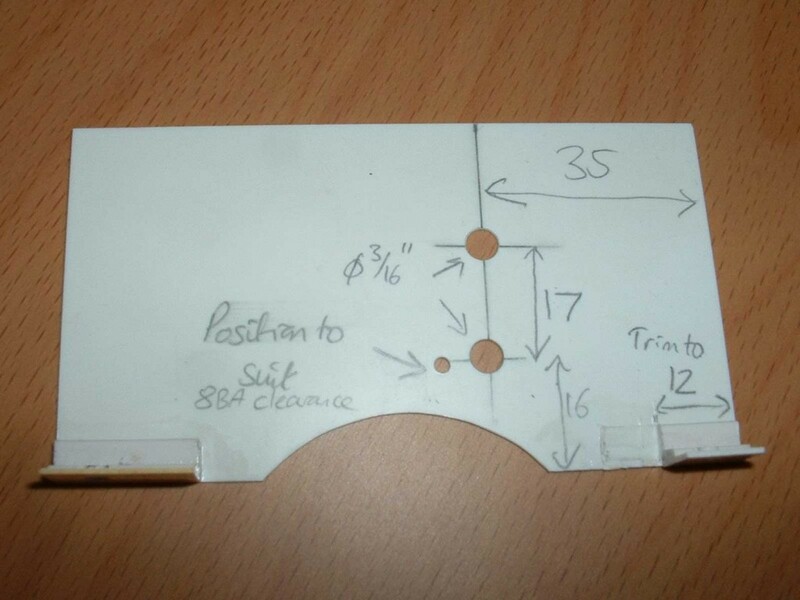 Working out the placement of the whistle, on a plasticard mock-up of the cab front. After consulting DJB Engineering, we came to the conclusion that whilst none of the DJB whistles was designed to fit this loco, the variant intended for the Roundhouse Fowler ought to, coupled with the whistle valve designed for the Silver Lady. Before doing anything drastic. I made a Plastikard mock-up of the cab front sheet and played around with the positioning until it looked like everything would fit. 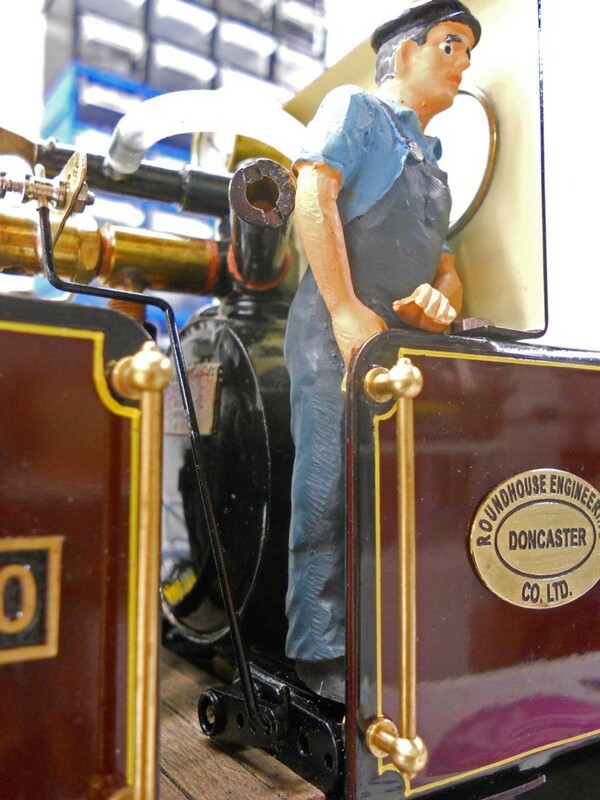 The Fowler whistle has a long, thin curved resonator which tucks down the side of the boiler. Reassured by this process, it was time to start attacking the loco itself. I had to remove a portion of the tab that joins the cab front sheet to the top of the right hand tank (junior hacksaw job), then it was time to drill. As luck would have it, not long before Lidl had done one of their special offers on a cheap pillar drill. The cab is getting quite well filled by this point. 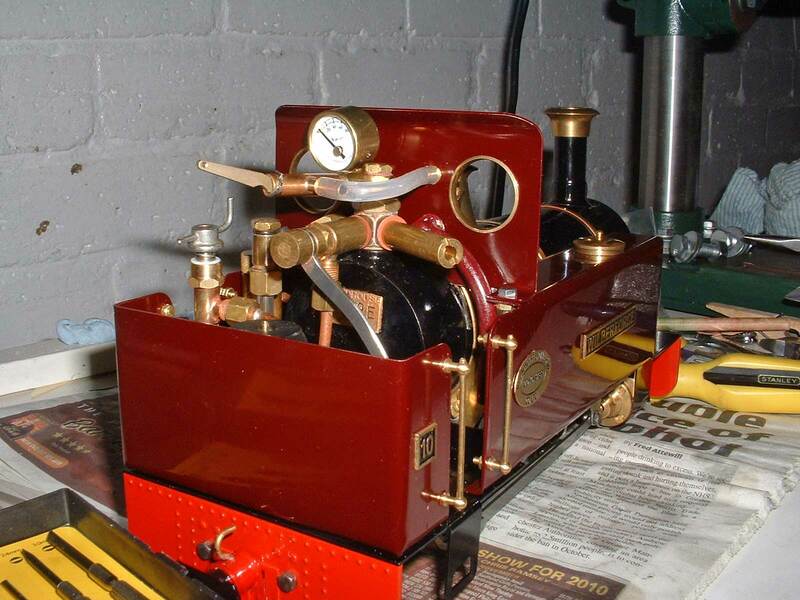 Having gained confidence with the drill I took the opportunity to add a smokebox handrail, and a lamp bracket on the coal bunker, before the bodywork was dispatched to Geoff at Lightline for lining in Talyllyn-style with black edging and a single yellow line. I’m sure it would have been easier for him if the nameplates hadn’t already been stuck on by this point – sorry! 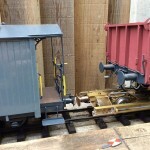 At the same time the smokebox and front footplating were given a satin finish. While the bodywork was away I took the opportunity to paint the wheels and valve rods, and to blacken a great deal of the brasswork that was by this point filling the cab. As it all came back together I switched most of the brass cheese-headed nuts and bolts for hex headed versions. And I added a coal load on top of the gas tank, and a wooden cab floor. And what a transformation it was! Back from being lined out – what a difference! With railway extension works taking up a lot of the available spare time, the pace of change slackened somewhat, though a driver from “Jons People” appeared, spectacle glasses were fitted, and one of those natty working lamps was acquired. 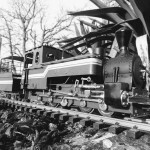 Many would say that these simple, slip-eccentric locos are ideally manually controlled. However, as the Solihull and South Birmingham group got underway, it became apparent that it would be advantageous for the EHLR to have a radio controlled locomotive available (following a number of slightly hairy incidents on other lines). It was equally apparent that the railway budget would not stretch at this stage to another live steamer. 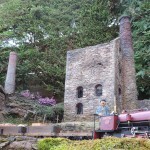 Visiting Shane Owen’s now dismantled Chyknell Valley Light Railway. So the decision was made to see what could be done about fitting Wilberforce with radio control. I acquired the Roundhouse radio control fittings kit. As I looked at the parts and the instructions, it was clear that things weren’t going to go in quite as Roundhouse intended. For one thing, the space where they would have me install the regulator servo was already occupied by the whistle resonator, and was also the driver’s favourite corner of the cab. 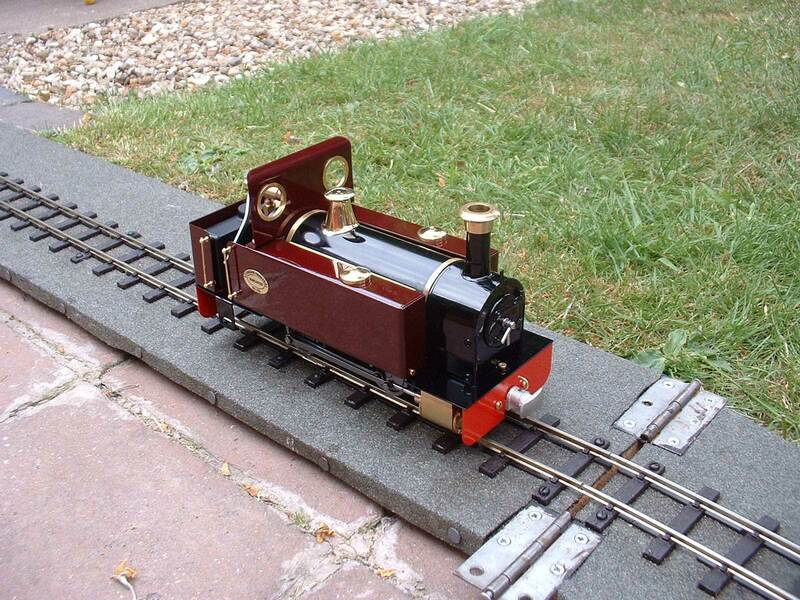 And, I wasn’t taken with the idea of fitting the receiver and batteries in a semi-permanently coupled vehicle. There had to be another way. The driver looks a little startled after the operation on his feet. Box under the cab floor contains batteries, receiver and switch. 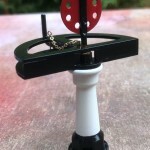 The driver stands on the regulator servo. Another box was fitted under the footplate on the left hand side containing the whistle servo and a charging socket; I had to remove the water gauge to make room, but to be honest I never really looked at it. 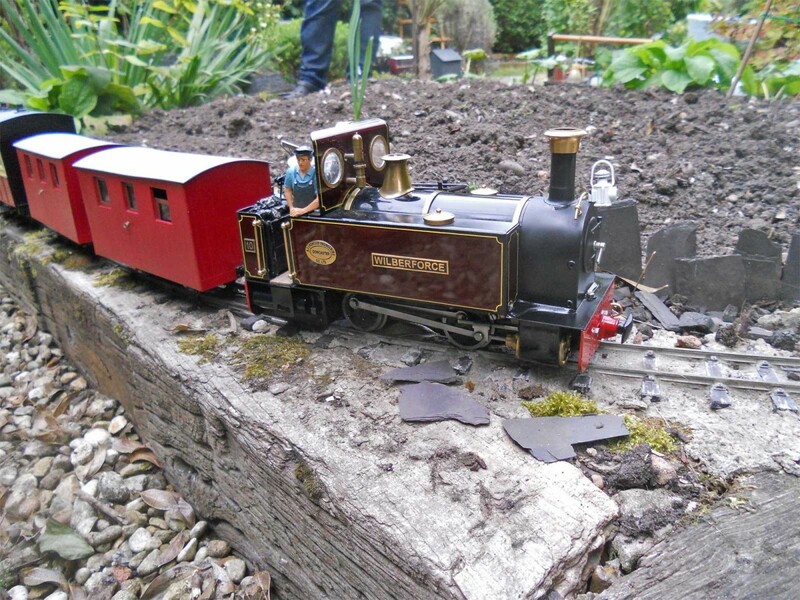 It was all a bit of a squeeze and makes it quite tricky to get the loco apart for servicing – but I was really pleased to have managed to fit radio without significantly affecting the loco’s appearance. 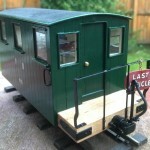 The whistle servo and charging socket are under the other side of the footplate. Drifting through Hendre on a short goods train. There’s one thing I’ve very carefully never done: I’ve not added up how much I’ve spent modifying the loco over the last six and a half years. Probably just as well. The added bits and pieces are nice to have but the modified paint job and lining totally really transform the loco and the radio control makes the loco very practical in use.